Today I added the other two dew heaters for the finderscope. One for the finderscope objective and the other one for the finderscope eyepiece. They are all wired to the controller that is attached to the rocker box. I also velcro’d some granite samples I got from the place we bought out granite countertops. 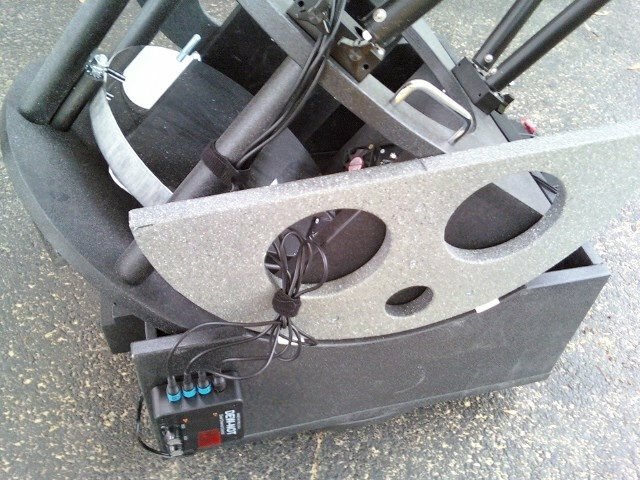 These provide nice, attractive counterweights to the back. And they are pretty low profile. The dew controller is a “Dew-Not” controller from http://www.scopestuff.com that I purchased from my observing buddy, Jim (thanks Jim!) 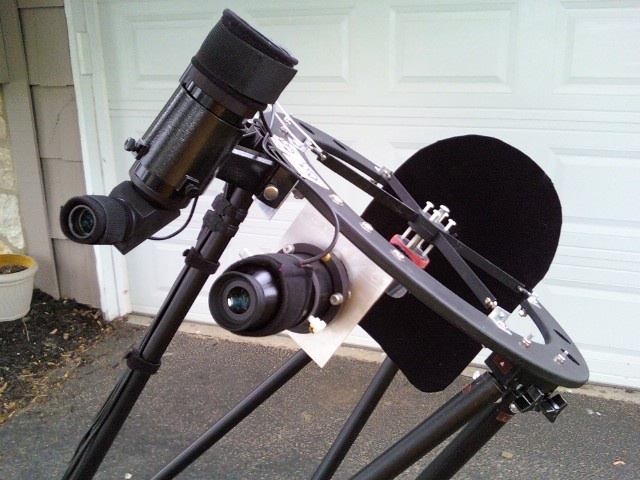 The dew heaters for the eyepieces and finderscope is also from scopestuff.com. The secondary heater is from Kendrick. I am calling the scope done (for now.. hehehehe). Someday I want to add a moonlight focuser, but for now, the HC-2 will work fine. Here is the view of the secondary ring. 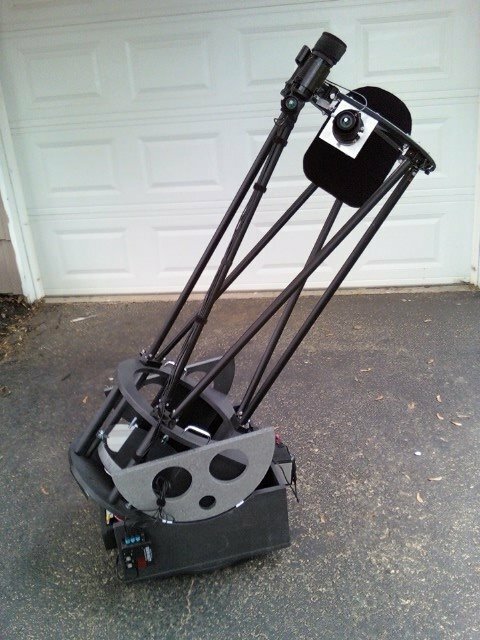 The finderscope is an Orion 9×50 right angle finder (I also like to call it the neck saver). You can see the dew heater straps on the finderscope and the eyepiece. The secondary has a Kendrick secondary heater. The rocker box with the “Dew-Not” controller. The wires are routed down the strut (I want to do this on the inside of the strut someday). 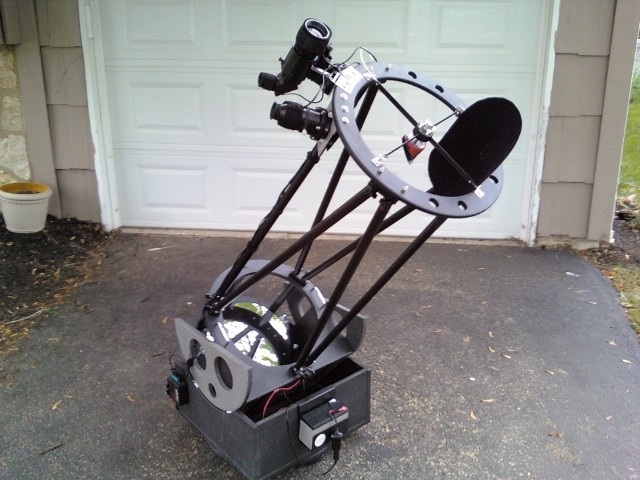 Front view of the scope. The 7Ah battery hangs off the front of the rocker box. It powers the dew controller/dew heaters. The 2Ah battery on the back of the rocker box controls the mirror fans. ~ by jhissong on 2009/06/08.